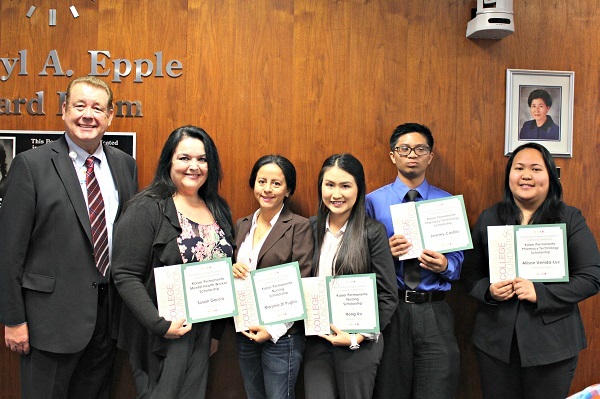 NORWALK, Calif. – December 8, 2016 – The Cerritos College Foundation recently awarded five students with scholarships funded through a grant provided by Kaiser Permanente. Each $2,000 scholarship is part of a larger $20,000 grant presented by Kaiser Permanente to the Cerritos College Foundation in 2015. The purpose of the grant was to recognize students studying the health occupations areas of nursing, pharmacy technology, and mental health worker. The Kaiser Permanente Nursing Scholarship was presented to first-year nursing student Marjorie Di Puglia of Los Angeles, and second-year nursing student Hong Vo of South El Monte. Allison Venida-Luc of Norwalk and Jeremy Castillo of Cerritos were each awarded the Kaiser Permanente Pharmacy Technology Scholarship, while Susan Garcia of Long Beach received the Kaiser Permanente Mental Health Worker Scholarship. The Foundation will be awarding the remaining grant amount in the Spring of 2017. Eligible students enrolled at Cerritos College may apply online at www.cerritoscf.org/getscholarships. About the Cerritos College Foundation: The Cerritos College Foundation, a non-profit organization, serves as a charitable vehicle for the community, individuals and alumni, to assist with financial support of Cerritos College. Visit the Foundation online at www.cerritoscf.org/getscholarships.